This morning, after a stretch of days already filled with so many amazing moments for our family, my kids are all officially on Summer vacation, and my husband, after six long years of working the night shift, is finally working days. It's such a special first day for all of us! Over the years we never quite adjusted to that crazy schedule. Although he worked with amazing people and loves his job, it's been hard him and he's always struggled with getting enough sleep. As for me, I've just missed him. Most nights after he'd leave for work, I went to the sewing machine. The big secret of how I get so much done each week. So many nights I've stayed up way too late sewing, all because of my own struggle with not being able to sleep without him here. Adjusting to the new routine of having both the kids and my husband here so much more is going to take a little time, but I'm so excited and know I'll work some time in at the sewing machine each day! On the kids last day of school I took a photo out on the porch swing, just as I did the morning of their first day of school back in August. What a difference, I have to share! Our oldest son, Kaiden, graduated from Elementary school this past Thursday. That means he's a high schooler now, since our little town doesn't have a middle school. 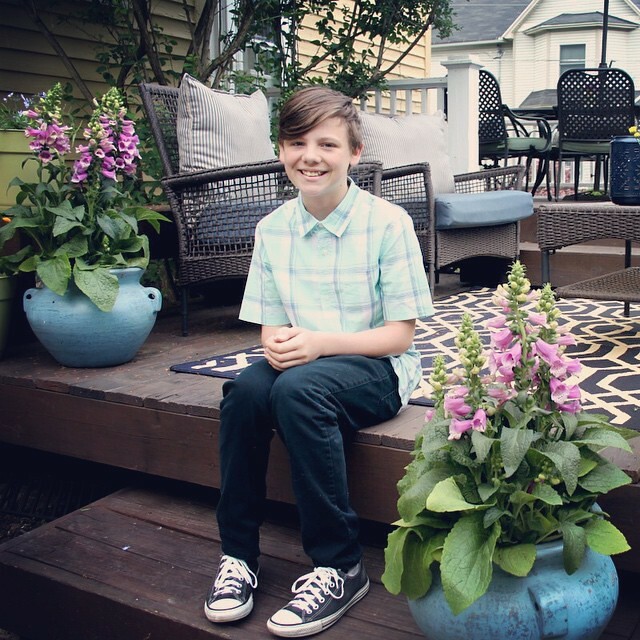 I can't believe that I'm the Mom of a high schooler and soon-to-be teenager. How can that be? Saturday marked another very BIG milestone for our little family. A day my husband has dreamt about since he ran in his very first marathon just four years ago. 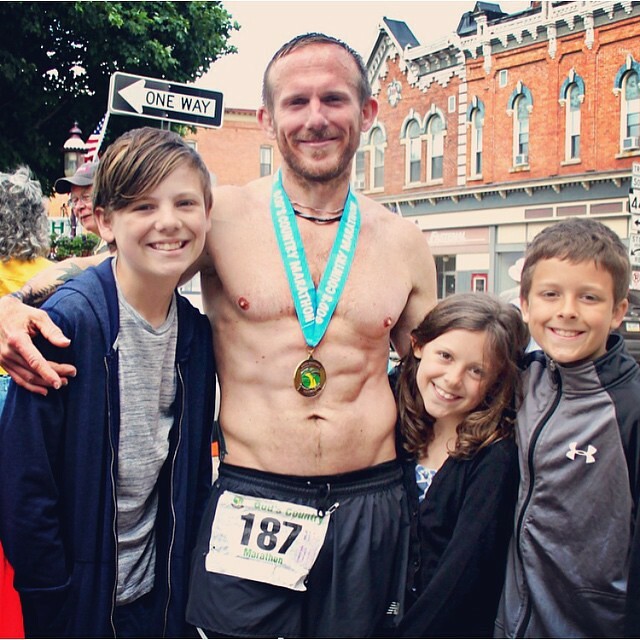 After months of the most intense training he has ever done, Kevin ran the local God's Country Marathon in 3:11! A personal best that qualified him for Boston, this time guaranteeing him a spot in that race. He won 3rd place overall in one of the toughest marathons in the World and surpassed his highest expectations. It was emotional and inspiring. I've never felt more proud, honored, grateful, and blessed! Tomorrow I promise to be back with more fabric goodness! I wish you all a wonderful beginning to this new week! WTG Cracknell family! Your husband crushed it! A big congrats to all of you! So glad your husband's schedule will allow for more family time and congratulations on his finish in the race! We are a 3 generation household and it is amazing how much they grow in a year. I had forgotten so much from when my kids were little and am now getting to relive it. Oh happy day! Congratulations to your family!! Congratulation! It's amazing how much kids change/grow in just one year. Your life seems to be coming together. What a great idea for the school pictures! Look at the difference! Love reading about your family and praying for all happiness in your new routine. Proud of your hubby, also. Great accomplishment. Victories for everyone in your family... Job well done Cracknells! :) I hope you'll enjoy having your hubby next to you all night again. (I don't sleep well without my husband either!) Happy summer vacation!! Congrats to all in your family, Maureen. Everyone looks so happy. What an awesome and inspiring update all around! Hello! The pictures of your kids are wonderful. Their changes are unbelievable! J.
Congratulations for all the good things that are happening in your life. Your family looks so happy! I got a little teary eyed reading that. Congratulations to your husband, What a sweet victory! Great pics and wishing you a fun an amazing summer! Congrats to you and your family....so many wonderful happenings! 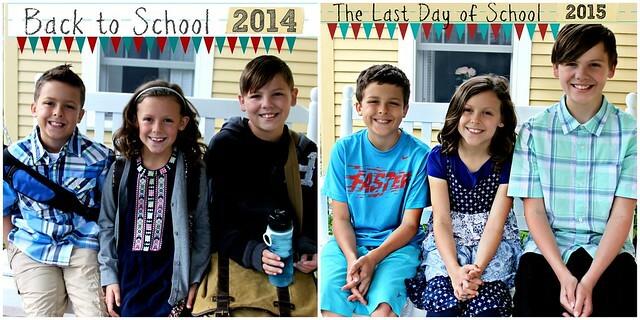 I cannot believe how much your children grew from the beginning of school! I used to take the first day of school picture but not the last day. Now, I wish I would have taken that too! What are you feeding them? LOL! Congrats to your husband! What an accomplishment! So glad you are all on the same schedule now....enjoy! It always amazes me how big kids get in one little year! A high-schooler? look out--good times on the horizon! And kevin, wow, that is AMAZING. Did you see sparks coming off of his shoes or what??!! Keep us updated for the Boston marathon :O) and best wishes for family life settling into something that soothes your soul again. What a great post! So happy for you & your family! You are going to love your new schedule when you get adjusted. I am so happy that the days ahead will be family filled memories. Congratulations to the high schooler AND to your husband. That is awesome and well earned. Yay for happy times and day shift schedule!!! I am mother to a 16 and 18 yo...I still think they should be toddlers in the grocery store with me!!!! I can now appreciate all the attentions we received from Moms of older children...I am that person now!!! Congrats to Kevin on his races!!! Nothing like getting in better shape as you get older instead of the other way around!!! Enjoyed reading about your family. You sound so real (and honest). By that I mean just like an ordinary family and not super woman/sewer/mom that I originally thought. I mean this as a compliment.